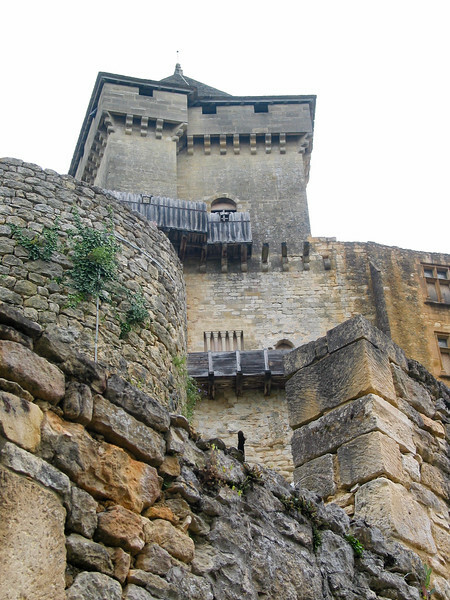 Castelnaud is the great rival to Beynac, then and now. Both are magical, but Castelnaud claims to be the "most visited castle in the South of France". It holds a musuem of medieval warfare, with various pieces of original arms, armour, and artillery scattered throughout, and also some re-created catapults and such. Castelnaud, founded in the 12th century, was ceded to the English in 1259, but reverted to the French in 1273. The rivalry with the barons of Beynac was subsumed by the start of the Hundred Years' War in 1337, during which the barons of Castelnaud often sided with the English. In 1442 the French finally recaptured the castle for good after a three-week siege. After this Castelnaud was peaceful. In the Wars of Religion it was in the hands of a powerful Huegenot captain, and it was not attacked. An impressive artillery tower was built in 1520, but only to reinforce the dominance of the castle, which fell gradually into disuse and ruin, quarried for its stone, until named an Historic Monument in 1969. Along with structural reconstruction, many rooms have been given over to museum displays, an armour maker's workshop, explanatory videos, and so on. They also give workshops on "The art of chain mail" and other fun subjects.